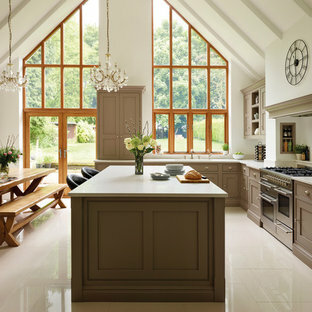 This client's kitchen is in a beautiful space with lots of natural light and dramatic features. 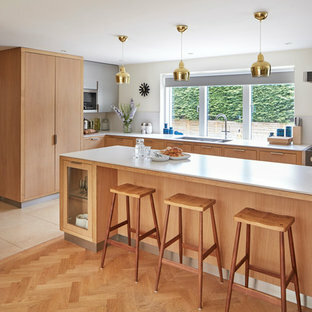 The cabinets are painted in Tom Howley paint colour Willow with Yukon Silestone worktops. A picture tells a thousand words. 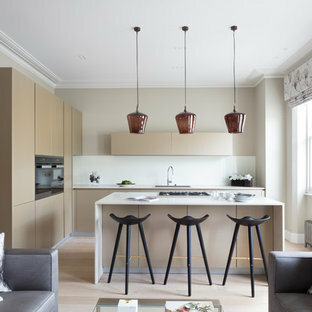 Many people ask us what our products look like in residential spaces, so here is a sneak peak into our latest residential project in a classic Victorian townhouse. The Buster + Punch Design Lab, designed, fabricated and finished this amazing space in East London. 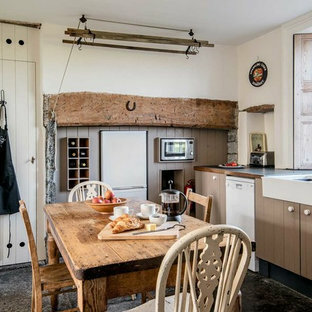 Silk quilting, Hooked lighting, private whisky bar, brass kitchen, bespoke woodwork, distressed chevron, 20ft master suite and all focused around a 100yr old Olive Tree in a double void space. 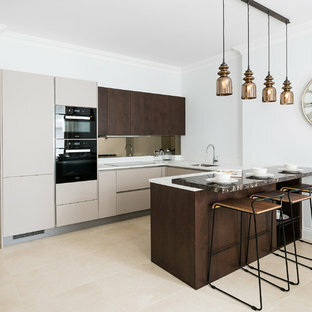 Bespoke Kitchens by HEHKU for a luxury 6 apartment block in Park Road Chiswick. 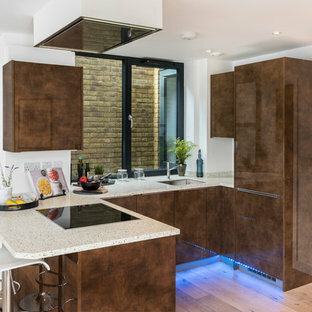 Miele fittings, recycled glass worktops and cabinets in a Bronze panel block. All fully integrated. 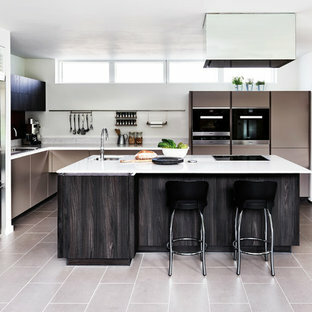 A sleek, modern and minimalist SieMatic kitchen designed with ample storage. 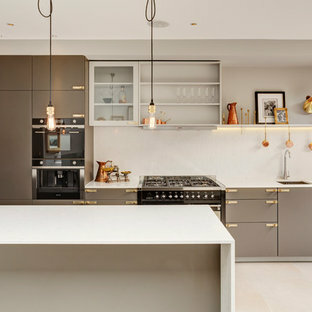 The combination of colours and textures make this kitchen an inviting and sociable space with all the style you’d expect from SieMatic’s high-end German design. 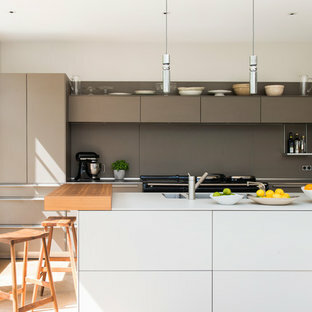 The interior of every single drawer and cabinet has been carefully considered so that each pot, pan and utensil has a place – even down to the owner’s passion for Japanese food and their collection of chopsticks and serving bowls. 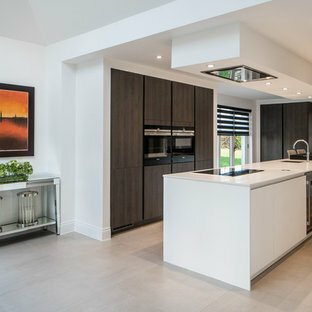 Appliances include a Bora Classic hob, Miele oven stack and Gaggenau fridge freezer. 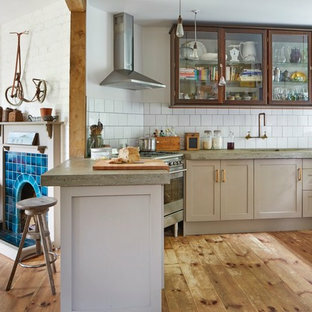 Quartz Form Cloudy White in 20mm has been used for the worktops.